If you read through this site for a while, you will quickly learn that lamb is one of my favorite foods. Probably the best (and most expensive) cut is the rack of lamb. The word tender is just not descriptive enough when it comes to this dish. Rack of lamb is very flavorful and is eaten all over the world. Even if you generally do not eat your red meat rare/medium rare, you should think twice about it with this dish. A well done lamb chop is nothing much to talk about. At the most, I would stand for medium, and even then I would be a bit disappointed. This recipe is not all that uncommon, I just added horseradish and a bit of a different technique. We enjoy this meal every so often whenever there is a good sale on racks of lamb. It can be a pricey cut, so keep your eyes peeled for sales on it. 2 rack of lamb cuts. 5 cloves of garlic, minced finely. 1 cup seasoned bread crumbs. 5 tablespoons of Dijon mustard. 2 1/2 tablespoons prepared horseradish. 2 tablespoons fresh grated Parmesan cheese. In a large skillet, add enough Canola oil to cover the bottom of the pan. Liberally salt and pepper each rack, on all sides. For some of my friends and family, the first question is going to be “What is Ratatouille?” Well, it is basically a French term for “tossed food” or “tossed vegetables”. The primary ingredients are tomatoes, zucchini, onions, peppers, and garlic. They are pretty much cooked together and produce wonderful flavors. I decided to step mine up a bit and add some mushrooms, chicken, and grill it instead of cooking it traditionally. The flavors from the grilled vegetables will make you look at them in a different light. It is hard to believe what grilling can do to plants! 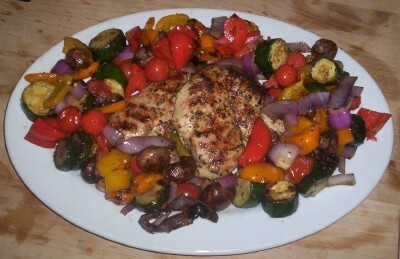 The chicken part of this dish is really not a part of Ratatouille per say, but my recipe combines the similar flavors so that the chicken goes hand in hand with the veggies. As for presentation, the colors are so vibrant in this dish, short of serving it on a manhole cover, there really is no way to make this look unappealing. 3 bell peppers (different color for each. I use red, yellow, green), halved, seeds and stems removed. 2 medium zucchini, cut in half. 1 large red onion cut into thick rings (don’t break them up). 1 container of cherry tomatoes (about 30). 1 container small whole fresh mushrooms (about 30, I used baby bellas). About 1 cup of white wine. This years early Thanksgiving was a hit. Every year we have what we like to call “Losers Thanksgiving”. It is a tradition that started about 15 years ago when talking to my best friend. I was telling him about my Thanksgiving plans I had, where I would go back home and visit the family. All of his family had moved away, and he basically told me he was not having any Thanksgiving and was just going to work through the holiday. Feeling bad for him, the Sunday before Thanksgiving, I decided to make a huge dinner, with duck, stuffing, cranberry, etc., and invited him over. Breaking his chops, I called it Losers Thanksgiving since nobody wanted him for the holiday. It’s a guy thing, we say such things to each other totally understanding it’s basis in humor. Well, after a couple years of this, Losers Thanksgiving became somewhat of a tradition. Even though eventually my friend got a girlfriend (actually a few since then), he fell out of the tradition, but it lived on. It became a time for friends and select family to get together before they went to their traditional Thanksgiving. Every year, the Sunday before Thanksgiving, we invite friends, neighbors, and family we would not see for the holiday over for an easy dinner that basically was a traditional feast. I have never really had too much flank steak in my life. I don’t know why, I just never got around to buying and trying it. So the other day I am in the supermarket just looking for something different to make. Staring at the butchers window I see this flank steak. Now I have seen them cooked on many a cooking show but I have never actually eaten it, or cooked it before. So what the heck, I buy it and decide to try and make my own rub for it. When we sliced this up, everyone at the table was astounded how well this came out. While I was searching for spices to make the rub, I came across one that I had never used before: Cardamom. Reading the spice guide in the store it basically had little information on it other than some people use it in pot roast. So, I figured I might be able to use it, and if not, I will try it for my next pot roast. When I got home and opened the spice bottle of the Cardamom seeds and smelled it, I nearly coughed. It has an aroma similar to a vapor rub, i.e. vicks. I gave it the one eyebrow look and wondered if I should not just put this bottle in the back of the spice cupboard. Chicken riggies is an Upstate NY thing. I have already written about how to make the red version, so I decided to show you how to make the more common white recipe. Mostly the difference here is the cream you add at the end and you also use less herbs and different oils. Where I come from, a bit North of Utica NY, just about every family function includes a dish of riggies. It is a powerhouse of a meal so unless your feeding 10-15 people, prepare for leftovers. 1 1/2 – 2 pounds cut up bite size boneless chicken (white or dark or both). About 2 tablespoons olive oil. 1 large yellow onion, diced. 5-6 cloves of garlic, chopped. 1 20 oz. jar of sweet peppers, drained, lightly chopped. 1/4 cup of pickled hot cherry peppers, lightly chopped. 3/4 cup fresh grated Parmesan cheese. About 1/2 cup of fresh basil, lightly chopped. 2 cups or so of chicken broth. 1 28 oz can/jar crushed tomatoes. About 24 oz of dry rigatoni, prepared as per directions on the box (reserve some of the liquid). 3/4 to 1 cup of heavy cream. In a really large sauce pan, add the olive oil, enough to coat the bottom of the pan. Heat to medium/medium high. Salt and pepper the chicken pieces and cook in batches until just done in the sauce pan and remove. With the relative success of my garden this year, I was fortunate to have a large amount of tomatoes and peppers. After canning a couple cases of tomatoes, I decided to make up some spicy salsa. It was nothing too out of the ordinary, just some tomatoes, red/green/yellow bell peppers, garlic and a couple handfuls of chopped jalapenos. Before I canned it, I took a little taste and it was pretty hot. My wife and kids are not much for hot tasting foods. In fact, they think Dijon mustard is spicy, so I figured this salsa would be around for a while except for giving away a pint here and there. Well, after seeing a few salsa chicken recipes I decided to throw this one together. I have only made it twice, but both times it was a hit. The cooking process took much of the heat out so even the kids had no trouble with the remaining flavor. This recipe can be made with any salsa, even store bought, but let me recommend that you go for one of the more spicier versions as it will lose some of the heat during cooking. I would also recommend you find a salsa that is low in sodium. Ideally, you would want to use your own home made salsa. 4-5 chicken thighs and 4-5 chicken drumsticks. About a cup of flour. 8-10 ounces cheddar cheese, shredded. Cooking with liquor can be rewarding. One meat that really seems to soak it up well is chicken. I have had many chicken dishes prepared with Southern Comfort, Tequila, etc., that I have lost count. Seeing as how there was a big sale on chicken this week, I bought quite a bit of it, so I started searching for some new recipes. After a while, I just got tired of looking and decided to create a new dish. I was beyond shocked when I finally tasted this one. I started by blowing the dust of the liquor bottles in my bar and smelling the flavors of some of the more sugary alcohols. I finally settled on Amaretto and Triple Sec. Going on just “step at a time” flavoring, this is what I came up with. 3-4 pounds chicken, cut up. 2 shots of Triple Sec. Two tablespoons fresh ground coriander, separated in half. 1/2 teaspoon of cayenne pepper, separated in half. 1 tablespoon extra virgin olive oil, plus some for drizzling. For the coriander, I just use an old pepper grinder and put the seeds in it. You can also get it pre-ground if that is all you have. This meat is delicious. You will never believe how tender it is. 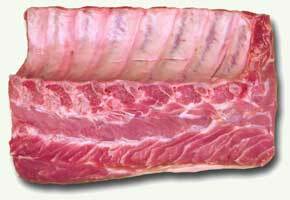 There are those who will brine this cut and there is nothing wrong with it, but in my opinion it isn’t needed. 1 4lb rack of pork. 3 1/2 cups chicken stock. 2-3 tablespoons Canola or vegetable oil. Generously salt and pepper the rack on all sides. In a large skillet (I use my cast iron skillet as it is perfect for this recipe), heat the oil to medium high heat. Sear the rack on all sides, about 2-3 minutes per side. The searing helps hold in the juices. Place into the oven with a meat thermometer until the temperature reaches 145, about 30-40 minutes. If you have ever been in upstate New York, around the Utica/Rome area for any period of time, chances are you have either heard of, or have eaten Chicken Riggies. How this dish came about is beyond me, but if I had to guess then I would say that this is the type of dish you get when you mix Irish, Italian, and German people together. A conversation with your average cook from the area will usually yield a chicken riggies recipe. Personally, I have come across several different versions. There are many that are cream based, and there are many that are tomato based. In fact, there are a few that contain both. I myself prefer the tomato based versions. Really, this is like the difference between red or white clam chowder. 🙂 I also have a recipe for the white here. Most of the recipes you will find though contain some common ingredients. These are chicken and rigatoni of course, and also some sort of jarred sweet peppers. Always on the lookout for new ways to prepare lamb, I found several that use lemon, a few that use lime, but not many that used both. I decided to take from many of these and combine a bit from this one, a bit from that one, to make something new. This lemon lime recipe for lamb has a different taste. It is very similar to some of the lemon based lamb recipes but with the fresh cleanliness of lime. I have used it for both lamb chops (loin) and for shoulder chops. It was an instant hit here with the family. 8 cloves of garlic, minced (it seems like a lot, but in the end the flavor is remote). 1/2 sprig of rosemary, stem removed, lightly chopped. 1/4 teaspoon of fresh ground pepper. 2 tablespoons of mint, chopped. 1/3 cup of extra virgin olive oil. Add the juice of the lemon and lime to a small bowl. Mix in the rest of the ingredients. In a large plastic resealable bag, add your lamb chops. Pour the marinade over the chops. BEFORE you put it all back in the refrigerator, let it marinate for a half an hour at room temperature turning once. You can marinade up to 24 hours, turning the meat on occasion.